"A new survey of attendees at Apple's annual Worldwide Developers Conference found that nearly half of iOS developers attending the conference support Android, while just 7 percent write applications for the Mac." Interesting survey to say the least, done by Piper Jaffray at the WWDC last week and released Monday. 45 developers were polled about a variety of topics. One interesting tidbit, while 47% of them also write for the Android platform, they prefer the monetization and ease of development via the Apple way versus how Google handles it. 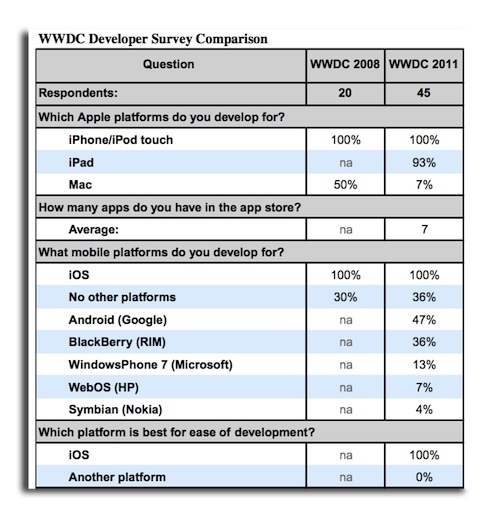 This comes on the heels of another survey that shows of all developers, 67% write for Android while 59% write for iOS. Both are up over last years survey by roughly 10%. That is a lot of growth, and while Android is outpacing iOS, they also found that iOS users are more likely to purchase apps. Granted, these are developers that all develop for iOS, but 51% of them also said that they saw greater potential for growth from iOS than Android. If you were to ask the 47% who write for Android however, 66% of them say Android has the higher potential. These are all just opinions of course, but educated ones from people that have been in the application business so you can't just write off what they say. I think the biggest point of all of this is that only 7% actually are writing for Mac. What do you think that is saying for the Mac platform?